Uber, the ride-hailing app that has become a widely-accepted means of transportation in many countries around the world has always been about their app. Very logically, because the app is what drives the service, and it’s because of it that Uber has scaled from a service that was only running in San Francisco, to one that is available in 507 cities (as of August 2016) around the world. Well now, they just did a major change to the user interface, and the update is now live to users worldwide. This was what you had before. 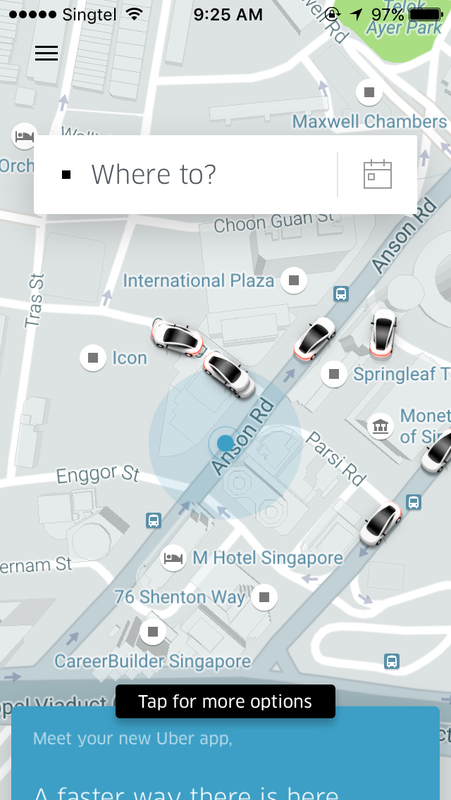 The all-too-familiar user interface for ardent Uber users to get themselves from one corner of Singapore to another. Everything was in your face – maps, location of places, prices, type of ride, and your personal information. Well, say goodbye to them. You may have noticed the update for your app is detailing some big changes coming your way. This is what you will see after the update. Gone are the boxes of information that used to clutter the screen – these are now hidden in a pull-up drawer at the bottom. Now when you load up the app, your entire screen will be a map showing your current location, with an empty field that simply asks: “Where to?”. 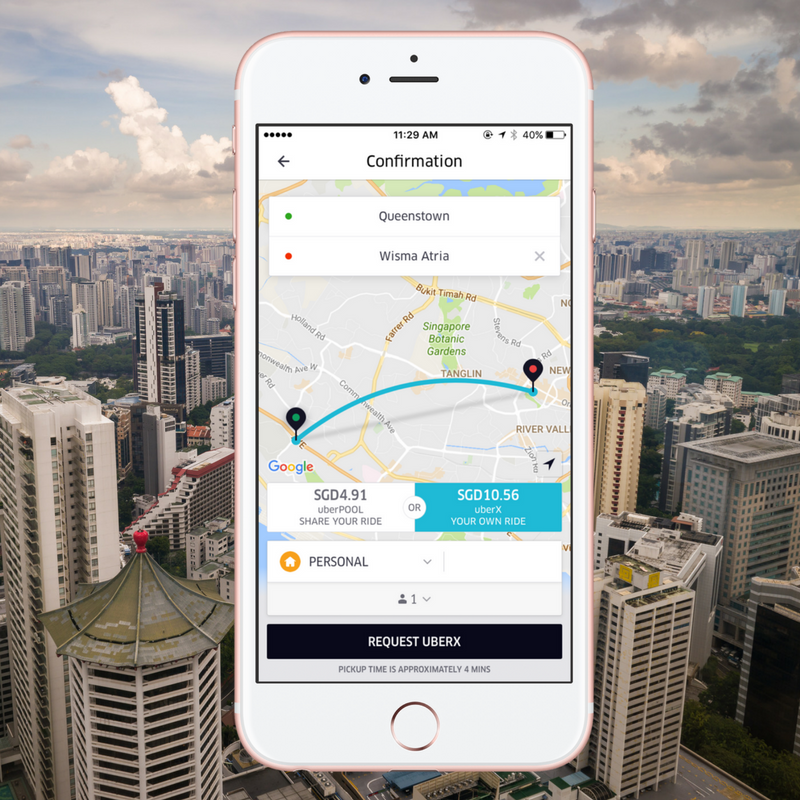 With this new app for Uber riders, it marks the first time that the company has done a complete redesign of the app since 2012. The update seeks to let people get on the move with just one tap. Like what I’ve mentioned earlier, the old app was becoming a mess, and Uber agreed. As they added new features along the way, it was just piled on endlessly to the main interface, so much that you cannot see where you are going anymore. 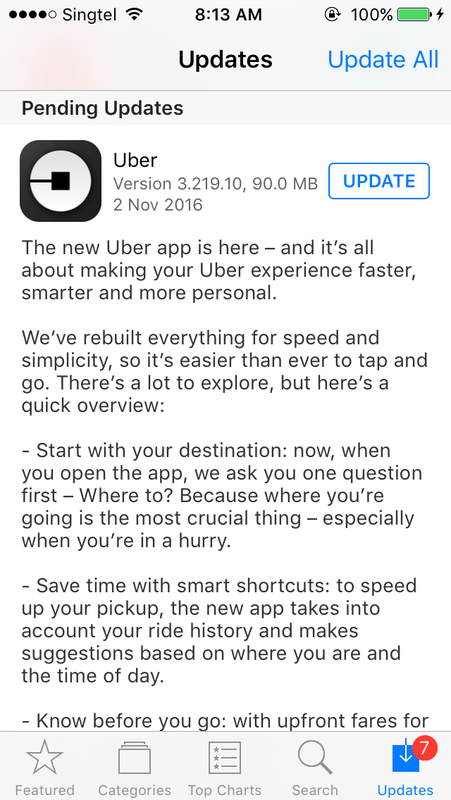 With all the unnecessary stuff hidden away until needed, Uber promises that this new app will be faster and smarter. The app will now learn your ride habits, giving you recommendations to predicted destinations the more you use it. One of the highlights for this new update is the ability to sync with your calendar on your phone. The app will generate “shortcuts” from your meetings and appointments for you to instantly request a ride to the location. Gone are the days of you having to dig through endless emails and calendar entries just to find an address. Speaking of that, now your friends have also become addresses. Syncing your contacts with the app enables you to use them as destinations (if they are Uber users themselves). This feature has yet to be rolled out, but it will only be a matter of time in the next update. So you’ve decided on where to go, now you have to choose which kind of ride you want to be in. First of all, now all the rides have been categorised into several tiers; Economy (uberPOOL and UberX), Premium (UberExec), Extra Seats (uberXL and ExecLarge), and More (Taxis). With all rides, you get an estimated time of arrival that is marked beside your current location, and also the estimated cost of your ride. With uberPOOL and UberX, you will even see an estimated time of arrival below their icons at the bottom bar. Uber says that this further simplifies the process of cost comparison for riders when considering the ride for different occasions. I would agree, especially for the two most widely-used options, as people are able to see if the cost savings are worth the extra traveling time, and vice versa. If Uber had its way, you will soon be checking train, bus, and subway timings from the Uber app as well. What I would like to see on top of that, though, are flight timings at the airport. I mean, for the other transit options, they may be more relevant in larger countries like the US where Uber is used as a “last mile service”. In Singapore, people take Uber across the country easily. That, along with food reviews through Yelp if you are using Uber to get to a restaurant, and neighbourhood exploration of the places you are headed to through Foursquare. If that’s not enough, Uber also wants you to arrive home at the same time as when your meal is delivered to your doorstep. 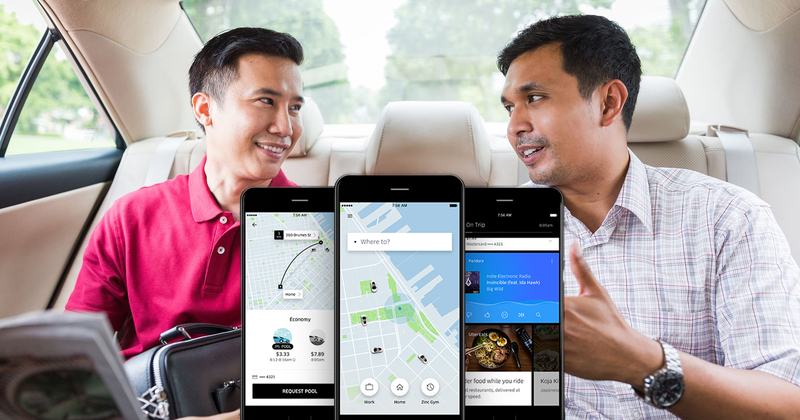 Greater integration of UberEats into the main Uber app is in the works, but at the moment I don’t see it very much unlike the official images which Uber has released today. That, along with Yelp, Foursquare, and transit timings, I’m guessing we will only see after Uber has done enough testing in the US and other larger countries, but it’s definitely something to look forward to, and it’s a clear sign that Uber is transcending from just moving people around.